With wild lions under pressure from so many threats, here is a wonderful comeback story. 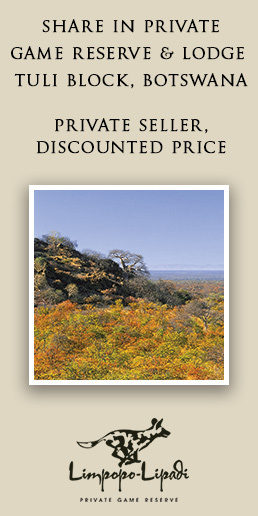 The 5,500ha Rietspruit Game Reserve outside the bushveld town of Hoedspruit and close to the Greater Kruger National Park, is made up of smaller reserves Leadwood Big Game Estate, Bloubank, Khaya Ndlovu Shareblock and Khaya Ndlovu Manor House properties. Last week I attended the release from a holding boma of five strapping young lions into the reserve. This was an exciting moment for owners of the various properties making up Rietspruit, and especially so for Kevin Leo-Smith – Leadwood resident and wildlife guru. Kevin and I go years back, and it was good to catch up as we waited patiently for the five lions to leave the boma area and venture into the reserve. 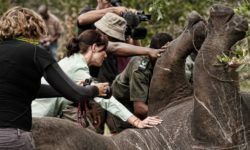 Kevin has played extremely instrumental roles in the establishment and commercialisation of two of southern Africa’s major conservation and tourism success stories – Phinda Private Game Reserve (South Africa) and Kwando (Botswana). As we waited in the shade of a tree, Kevin explained the lengths one must go to, to ensure that only healthy and genetically robust lions are placed back into wild areas. 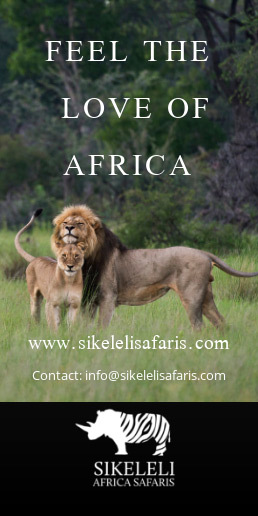 The introduced pride consists of three young male lion siblings from the nearby Karongwe Reserve and two young females sourced from Marakele National Park. The two groups were relocated to the boma in Rietspruit, where they got to know each other. Only once they showed signs of bonding did Kevin arrange for the release from the boma. The securing of lions with no signs of bovine tuberculosis proved to be a challenge. 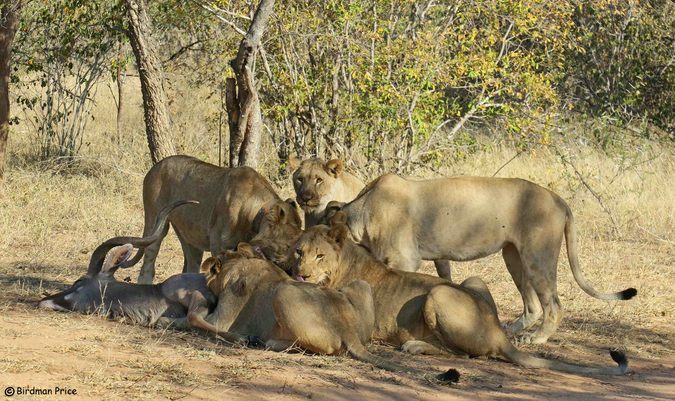 TB has reached alarming proportions in lion populations, even in the Kruger National Park. 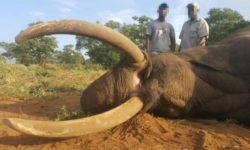 The entire release process was under the supervision of Dr. Peter Rogers of ProVet in Hoedspruit, who is one of the most experienced wildlife vets in Africa. The standard TB test protocols were followed, working with Prof. Michelle Miller from the University of Stellenbosch’s Centre of Excellence for Biomedical Tuberculosis Research. 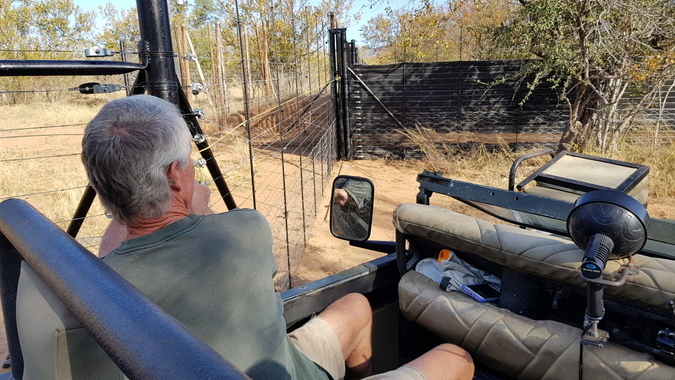 Three lions originally selected for release at Rietspruit all tested positive for TB, and were euthanised, in line with protocol designed to protect the greater lion population. 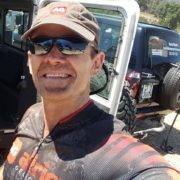 This was of course a massive disappointment for Kevin and his fellow Rietspruit owners, but everyone of course agrees that protocol has to be adhered to. Once the five healthy lions were together in the boma, the emphasis shifted to ensuring that they bonded as a pride. There was some expected tension between the males and females and although one female at 2.7 years old was heavier than the 22-month old males, the males dominated the feeding opportunities. This led to initial challenges of getting enough food to the females. However, after two weeks things had settled and the lions were making voluntary contact outside of feeding times. 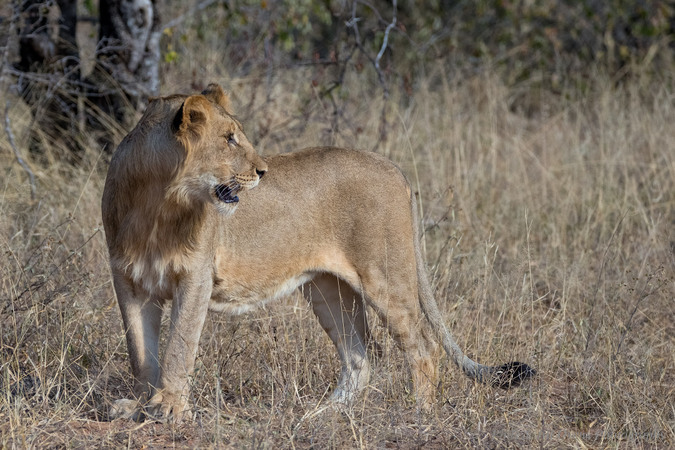 Other boma challenges included the provision of meat without the lions associating food with vehicles or humans – essential to avoid problems between lions and humans once the lions were released into the reserve. 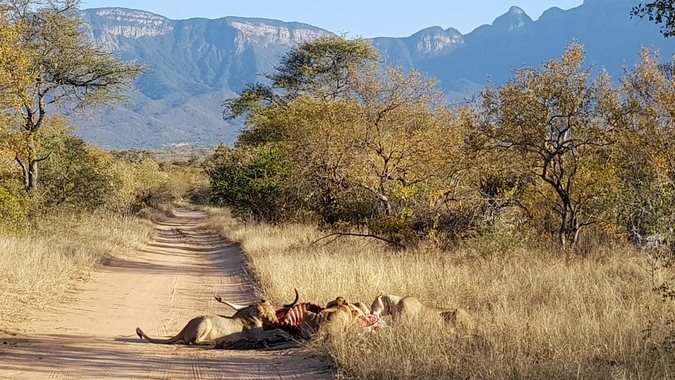 I have to admit to a sense of elation as these young lions plucked up the courage and darted out of the boma, with much cautious scanning of the surrounding bushveld. 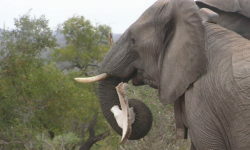 They immediately settled to feed on a kudu carcass left outside of the boma for this purpose. There was a bit of hand-bag swinging initially, but after a few hours of feeding we had 5 flat cats with round bellies – with the magnificent Drakensberg mountains looming as backdrop. The lion reintroduction was done with prior approval from LEDET (The Limpopo Department of Economic Development, Environment and Tourism). 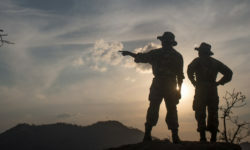 UPDATE FROM THE FIELD: Kevin advised me that the lions are exploring the reserve and showing no signs of walking the boundary fences, suggested that they already feel at home. 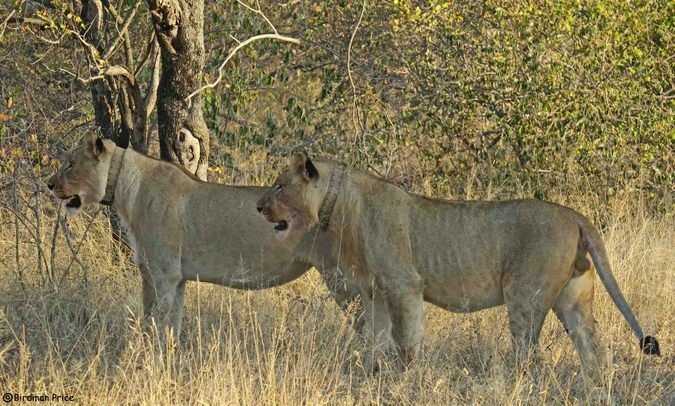 The collared lioness has been on heat and the males have been showing interest. It’s too early to know if there was a successful mating, and further information should be available later this year.